British independent studio Big Evil Corporation has released its debut game, fantasy puzzle-platformer Tanglewood, for the Sega Genesis and Steam. No, you haven’t time-traveled back to the 90s. 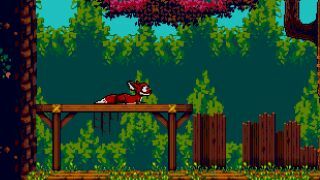 16-bit side-scroller Tanglewood is a brand-new title for the Sega Genesis (also known as the Sega Mega Drive in regions outside North America), but will also be available on Steam. The charming platformer sees you playing as Nymn, a fox lost in the dark and mysterious Tanglewood, who must find his way out of the wood and back to his pack. However, while Tanglewood is full of creatures who wish to help Nymn, there are also dangerous beasts hunting him down. Tanglewood was created using original 1990s Sega development tools after being funded by a Kickstarter campaign in 2016. However, unlike some older Sega Genesis titles, Tanglewood is playable on PAL, NTSC and NTSC-J consoles. The Sega Genesis was released in 1988 and was Sega’s most successful console, selling over 40 million units worldwide. The much-loved console is responsible for introducing the iconic video game character Sonic the Hedgehog. Tanglewood is available as a physical Sega Genesis cartridge for £54.00 or on Steam for £14.95 / $17.99 / $AU20.95. Unfortunately there’s no official US or Australian price for the physical cartridge.